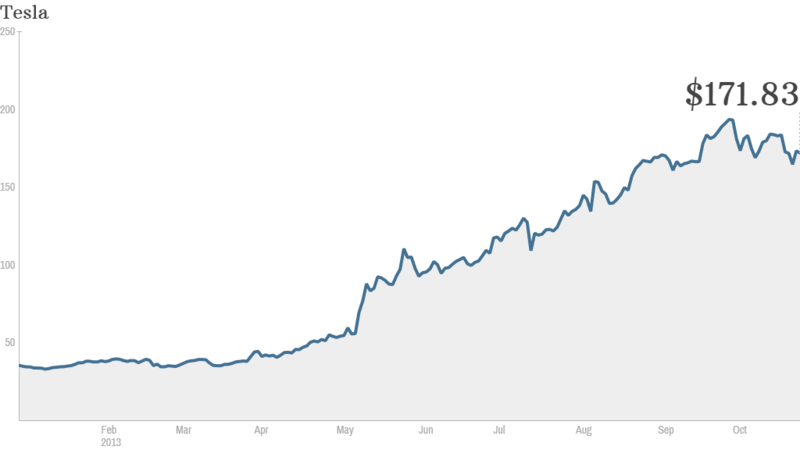 Click the chart to track Tesla's stocks. Tesla investors may be all smiles for now, but CEO Elon Musk is warning them that the stock is overvalued. "The stock price that we have is more than we have any right to deserve," he said in London Thursday at the opening of a Tesla showroom in London. And he's got a point. Shares are up 400% this year and are trading a nearly 100 times 2014 earnings estimates. It's not the first time Musk has said that Tesla (TSLA) shares are flying too high, but investors haven't really bothered to pay attention. He used almost the same language about the stock's valuation during an interview with CNBC in August. But the stock has climbed 10% since then. Musk's latest comments come just a few days after Netflix (NFLX) CEO Reed Hasting's note of caution about his company's stock. In a letter to shareholders that accompanied the company's earnings report, Hastings said some of the "euphoria" for the stock feels like 2003, when shares of Netflix rallied 400%. The stock plunged in 2004 and has been fairly volatile for the past decade. This year, Netflix's stock is up a considerable 260%, making it the second best-performing stock in the S&P 500. Shares are trading at 85 times 2014 earnings estimates. "Momentum investors" are "driving the price more than we like normally," Hastings added during a conference call with analysts to discuss its strong third-quarter earnings. It's fairly rare that CEOs try to talk down their stocks, given that one of their goals is to boost shareholder value. Experts say investors should take heed. "If the guy who runs the company and has insight is saying something, you need to read those tea leaves," said Joe Saluzzi, co-head of equity trading at Themis Trading. Investors should also keep an eye on what insiders and other big investors are doing with momentum stocks, Saluzzi said. Earlier this week, billionaire Carl Icahn said he dumped more than half his stake in Netflix and booked a sweet profit. Still, it's difficult to call a top for momentum stocks. "The market can be irrational, and who knows how high these stocks can go," Saluzzi said. Short-sellers, investors who bet certain stocks will go down, have all but given up on the high flying names. Short interest, which is the number of shares being held by short sellers, in Netflix has declined from almost 15% of outstanding shares in January to less than 2% now. In Tesla, short interest dropped from almost 25% earlier this year to just 10%. "It's very difficult to short these stocks" Saluzzi said. "Even if investors have good reasons they think the stock should go down, they can get their faces ripped off." And even though Musk warns Tesla's stock is too high now, he is optimistic that somewhere down the line, Tesla will grow into its current valuation. "We're going to do our best to fulfill the expectations of investors, and I think in the long term that stock price is going to seem fair," he said. But would you really expect him to say otherwise?